Valerie: Today is Tuesday, 5th of September 2017 and we are at Moss Vale, Australia. And with great love and respect we are calling upon Cosmic Sai Baba to make his presence today. 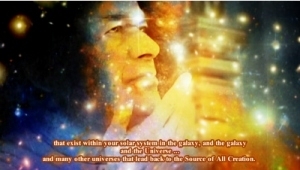 ❝It is I Cosmic Sai Baba and I am very pleased to be here. I have been with you all this morning; in fact I am always with you. Valerie has talked about Starpeople, and I would like you to know that you are Starpeople. Everyone is a starperson! They all come from different places – when you incarnate onto this Earth you have come from somewhere else. And when you leave the body that you have on this Earth – you go somewhere else. Nothing ends – there is no beginning, middle, and an end at all – it is constant and the life that you live is constant. There are various lives; there are very different lives, and there are very different races as I have said before – but there is life. And I would like to focus on the benevolent starpeople and there are millions. They have united in planetary nations – like your United Nations – and they only wish to help the little Earthling. Because the little Earthling is troubled. It is not sorting itself out to live a life of Peace and Harmony. And there are many upon this Earth that worry and see no future – in fact some want to take their lives or give up – they feel there is no point. But where do they go to and where did they come from? I can say, they all come through an agreement. And that agreement is the Soul, within the Soul. It is written within their Soul and more or less in the lives that they are going to live together on this planet Earth. Because I say together – I mean there will be other souls involved. So it is like a passport to come onto this Earth. And there are those that are organising this. There is a Hierarchy – there are people helping those that want to live a life on this Earth to help humanity. Also for those who are coming from a place where they are not evolved and they do not understand what the warmth of love and family is. And that is one of the big things they have and experience when they come onto this Earth. There are many reasons why different starpeople from other worlds come through a body with a soul onto this Earth – but they come. ALL of them agree to come; to help one another. I would like to remind every soul upon this Earth they have come to help one another. Some understand more and some understand less, but that is the point – to help each other. And God is Love – you must remember this! So it is always to help one another and never hurt one another. To help ALL. That does not mean to say you have to be friends with everybody – merely because different personalities meld and enjoy each other’s company – some not so much – some very much enjoy others. This is a choice – this is what you have on Earth – you have choice! And choice is what you are called upon to decide whether you really want to raise in consciousness and return to a God Being which you are as Soul – in the Source of your Soul. Every little child that is born is a God Creature. You cannot deny that by looking at them. You are All Magnetic Forces that attract! It is up to you to what you reflect and so that is your choice. And so that is possible to heal. It is possible to let go all the past and that is what you are being asked to do right at this very time. There is much to let go from past times. Past Lives or shadows that you have within you, hanging around you that need to be dealt with. It needs to be looked at and discarded so that you are Free. You are Free to be the Light that you really are–and have always been. It is not something that you cannot be because you don’t know – you do know – at another level of consciousness you do know! And you can tap into that if you want to make that change within you; and then merely ask for help from the benevolent starpeople, or Angelic Beings – they are all starpeople – they are all coming from other world places. Ask them for your assistance and they will help immediately. As soon as that request goes out, it will be responded to. As I have said, it is not always responded in a way that you think it should be, but if you think of the overview of what is causing, or what you need to know, then you will find you will be assisted into new doorways perhaps, that you have not thought to open at times. But you will be guided. Everybody has a different path – some are very similar and others, as I have said before, some have a path that is difficult but again there is always a reason and a purpose for that. Assistance will come to them always. And others will be prompted to assist them even at your Earth dimension level. There are many very good hearted people that would not – say – understand about the starpeople nor would they ever think about it or take it seriously. There are others that take it seriously and they are afraid. This is something you need – and you can – work at in helping people to allay those feelings. There is nothing to be worried about. The Source of All Creation is LOVE and it is not going to hurt anyone. That Power is safe, it is kind, it is caring and it is Loving. I think I have said enough for today … but I am aware that there is a lot of joy in the room today and that pleases me to see it. Try to help others to get into that state of mind. Because there are quite a few that are disheartened – and in fact they are depressed. And even feeling suicidal so be aware of that problem within someone. They may try to hide it – it is a need that you need to be aware so that you can assist them. Thank you my children, thank you. I love you.